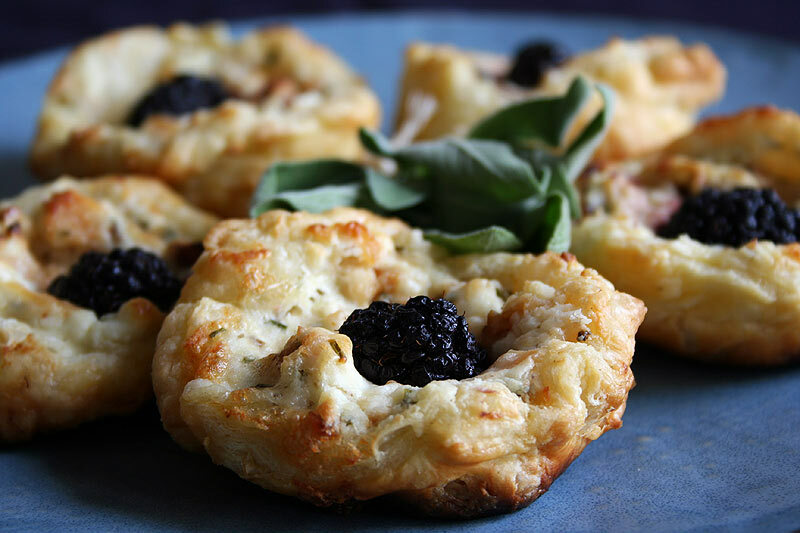 As an appetizer, we’re eating tarts made with smoked wahoo, cream cheese, saint andres cheese, sage and blackberries in a puff pastry shell. T: These things were awesome. Really good. T: If we weren’t saying that so much then we would need to reconsider our(your) hobby! A: heheh are you telling me that you wouldn’t eat my food if it wasn’t good??? you wouldn’t even humor me? T: I would definately eat it… but I don’t know if I would take pictures of it and post it for the world to see! A: heard! well at least i know you’re sincere, right? You really can’t go wrong by combining smoked fish, cream cheese, and puff pastry. T: I can sure as hell go wrong with fish, cream cheese, and puff pastry. You can’t go wrong with them. I’m actually quite afraid of what would happen if I was given those ingredients and told to make something with them. I would probably try to build a little castle or something. A: lol, dude! That is totally inovative! why didn’t i think of building a little puff pastry castle with smoked fish and cream cheese holding it together! T: because it’s a very, very bad idea. We’re not playing with legos. There aren’t any pirates that are going to come on shore and raid the little castle. We’re talking about food here. A: uhhhh…dude… did the pirates raid castles? T: Well they did when I was growing up. You see, I had the pirate legos, and I had the castle legos. I didn’t have an extensive background in european history at the time. I think some spaceships may have come into play at some point in time as well. They were raided by pirates too. A: it’s good to see that the pirates in tylerland didn’t discrimi-hate between all the other creatures of the universe. T: peace and unity, baby. Uhmm.. ok, moving on. Those were some killer tarts! If I were a pirate in real life I would pillage and plunder for them. T: save that for our other blog sweety. A: woah duder… this post has gotten a little wierd. T: yeah, once you started the roleplaying. A: heheh i wasn’t the one who brought pirates and spaceships into it! T: no, I did. And that’s why you don’t want to give me ingredients and tell me to make something with them. A: actually i really would like to see what you’d do with them… the possiblities are not endless. there’s only so much to do with those three things. A: you’ve just got to have a little faith in your palate, man. you eat stuff all the time. you know what tastes good! T: someday I will cook. Once we retire next year. A: 😀 you will also cook when we do the WWE special switcharoo. T: ahh yes, the switcharooni. Where I cook and you post. That should be interesting. Back to the tarts, I rate them a 4.65/5. I thought they were stupendous. I was delighted by the smoked fish and cheese and blackberry. MMmmm. A: Thanks T! i don’t know that you’ve ever used the word stupendous about my food before! very nice. this was kind of a clean the fridge appetizer. we had a leftover sheet of puff pastry, leftover blackberries, leftover smoked fish…you get the picture. i didn’t buy anything to make these. (i just used what was left from my family coming to visit.) I give these little tarts a 4.3/5. If i had remembered how our freaking tiny oven cooks (seriously guys…it’s the size of a microwave) i wouldn’t have slightly charred the bottoms. Give that, they couldn’t have quite as high of a score as i would otherwise have given them! T: The bottoms didn’t particularly bother me. Except when you cut off the black part and I microwaved them and scalded my hands badly. T: Emotional marks are hard to see sometimes. A: heheh whatEVER if you can’t take the heat, get the *%$# out the kitchen! T: I’m going to play with my secret stash of legos now. Preheat oven to the tempurature suggested on the puff pastry box. Thoroughly mix together the cream cheese, heavy cream, and hot sauce in a mixing bowl (i suggest using a wooden spoon). Stir in the sage and smoked fish. Taste the mixture, then season with salt and pepper as necessary. Roll out the puff pastry with a rolling pin and using a 3 inch ring mold (or a wide rimmed glass, if you don't have a ring mold) cut out as many puff pastry circles as you can. One sheet yeilds about 7-9 circles. Place a few tbsps of the mixture into the middle of a puff pastry ring and make a free form tart with the pastry coming up at least as high, if not higher, then the filling. It maybe easier to use a muffin tin (or even a mini muffin tin) for these, but i don't own one, so it's not necessary. Repeat making the tarts until all the filling has been used. Before baking place a blackberry in the middle of each tart. Bake for 15-20 minutes or until the pastry is golden brown. Serve warm, chilled, or at room tempurature. Enjoy! I absolutely never would have put the combo of blackberries and smoked fish together…very innovative. I would, however, have put the combination of pirates and spaceships together! Hi Amanda – I didn’t know what wahoo was the recipe sounds interesting, we have loads of blackberries in our friend’s allotment so I’ll give this try when they are ready. Beautiful shot, as always. Michelle, i’m starting to think i’m the only person who wouldn’t have naturally put the combination of pirates and spaceships together! now food, i’m excepting of all unusual combos Thanks! Hi Keiko, i’m sure the recipe would work with any smoked white fish! I can’t wait to see what you do with those blackberries. Whatever it is, i’m sure it will be absolutely lovely! Kiddos, I’m totally feeling this recipe for my husbands upcoming birthday party. Recipe, s’il vous plait? I would be, as usual, most indebted. your puff puff didily pastriies sounds mighty, MIGHTY fine lil missy. fine as the mighty mississippi river, D-DAAANG , youur picture ain’t that bad either, alrighty now yall have a mighty fine day, ill come back now ya hear?! KUDOS to this.